Koi live in water, and we love beautiful koi. A koi can only be beautiful if they remain in top condition. And no one wants to see sick koi in his pond! Usually, poor water quality is the cause of sick fish and pond problems. Providing koi with good healthy water is actually the most important and basic rule for keeping koi. The water must therefore always be of good quality. This means clean, so no waste that you could see, but even more important is the waste that cannot be seen such as ammonia. Water quality is a term used to describe the biological and chemical composition of the koi pond. 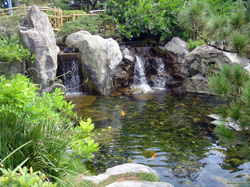 For our koi ponds are a number of values are important ​​and I will try to explain what they are and why. Always first test the water quality. The water quality of the pond water should be good, before you start a treatment. PH, GH, KH, ammonia, nitrite and nitrate. PH indicates the acidity of the pond water. This value can vary between 0 and 14. The value of 7 is neutral, below 7 is acidic, a value above 7 is alkaline. The ideal value for koi is between 6.8 and 7.5. A sudden change in the value can cause the fish to experience stress and the mucous membrane to be affected. The overall hardness of the water is indicated by GH. Soft water allows for faster growth and a better development of the red color. The white and black colors will develop better in hard water. The GH-value is a measurement for the total water hardness (mineral content). Both fish and plants need minerals so a GH-value of at least 6 is safe. The carbonate hardness is indicated by KH, this is mainly determined by the concentration of calcium and magnesium salts. A deficiency of this gives a lower pH value. When the KH value is too low, the pH can show fluctuations which is very bad for the healty state of our koi. When the KH-value is at least 5, the pH-value is stable. Ammonia is a toxic substance that at can already cause serious problems in low concentrations as from 0.2 to 0.5 mg / l. Koi excrete this ammonia. Ammonium is not dangerous in itself, but converted into ammonia its dangerous again. The degree in which ammonia is toxic depends on the pH value and the water temperature. The higher the pH value and water temperature the more toxic the ammonia is. The very toxic Ammonia (NH3) causes disease and acute mortality. Too high concentrations of ammonia occur in a new pond, a filter with problems (inadequate) or with (to) high stocking rates. Check, especially in these situations, the ammonia content daily. When the ammonia content is above 0.15 mg / liter, change 50% of the water immediately, and 25% daily after that until the value is acceptable. Also, stop feeding your koi immediately. Nitrite is formed by the decomposition of ammonia and its dangerous for koi above 0.3 mg / l. Nitrite (NO2) is highly toxic and therefore dangerous for your fish.Above this value, you must immediately change 50% of the water immediately, and 25% daily after that until the value is acceptable. Also, stop feeding your koi immediately. When nitrite is decomposed(or oxigen added) in your biological filter, nitrate remains. Nitrate in itself is not very harmful for the koi but higher concentrations ensure that the algae grow well. To remove or lower the nitrate contend, regular water changes are necessary. Nitrate (NO3) is a useful nutrient that is absorbed by plants and algae. The nitrate level may become too high in ponds with lots of fish. Is the nitrate value 50 mg / liter or less then you are always good, with a value above 100 mg / liter one should start changing water. • Nitrate (NO3) <0.50 mg / lph. Do not use all kinds of water value changers regarding pH, GH or KH but thrive to hige constant values. This is best done through regular water changes. (in the Netherlands the tap ater is already excellent). The worst thing for Koi is an ever changing water quality. So accept the values ​​you get with tap and choose your koi with these values ​​on your mind.